Stripgenerator.com - Restaurant Problem ! 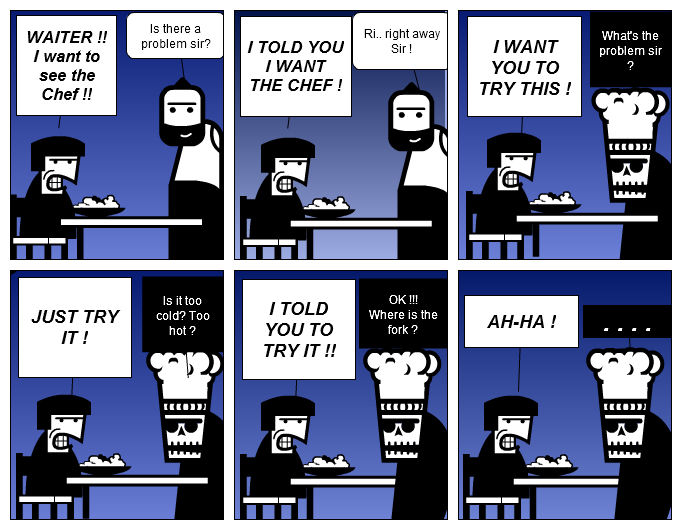 This strip is a reply to L'attaque des frites 13, My Bone!! !, 6.., Philosophical, ZOLTAR'S VOODOO DOLL !! I want to see the Chef !! I TOLD YOU I WANT THE CHEF ! Ri.. right away Sir ! I WANT YOU TO TRY THIS ! What's the problem sir ? Is it too cold? Too hot ? I TOLD YOU TO TRY IT !! Where is the fork ? cool strip on a classic!